Direct credit to Peso and Dollar accounts maintained with any domestic branch of Philippine National Bank. This service enables the beneficiary to withdraw funds from any PNB branch and from any Automated Teller machine if it is an ATM account and GFC. For GFC US$ Account, withdrawals are available over the counter of any PNB branch nationwide. Remittance is immediately available after processing at PNB Remittance Centers. Beneficiaries with no bank accounts may claim the remittance at the PNB branch counters in the Philippines. Funds are immediately available for pick-up after processing at PNB Global Remit branch. This facility is available for Email Money Transfer (EMT) and PNB agents' transactions only. 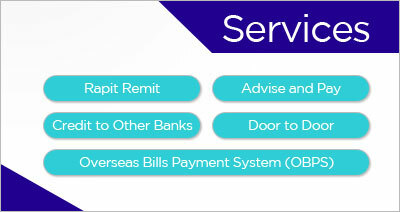 Cash door-to-door delivery, funds are delivered at the residence or place of the beneficiary. Normal delivery is within 1 day if location is in Metro Manila and nearby cities. For provincial location, delivery is within 2 to 3 days. Funds may also be delivered in the form of Manager’s cheque, at the request of the remitter (However, per ABRO agreement funds over PhP 50,000 shall only be paid in the form of Cashier’s/Manager’s Cheque). Remitters who wish to send funds intended for beneficiaries' accounts maintained with other Philippine banks can avail of this service. Funds will be transferred to the other local banks within 1 banking day; subsequent credit to the intended accounts shall be dependent on the other banks' delivery system.